With this groundbreaking work, educator Jenifer Fox is poised to change the conversation about education in America. For too long, parents and teachers have focused on identifying and 'fixing' kids' weaknesses to improve academic performance. Passionately written and informed by Fox's twenty-five years of experience, Your Child's Strengths turns that flawed paradigm on its head. Fox's strengths-based philosophy provides the tools to prepare kids for the future in a world that demands greater adaptability and creative thinking than ever before. The narrator's voice and reading style are distracting to me; particularly when she attempts to read in the voice of children. However, I agree with the ideas presented in this book. 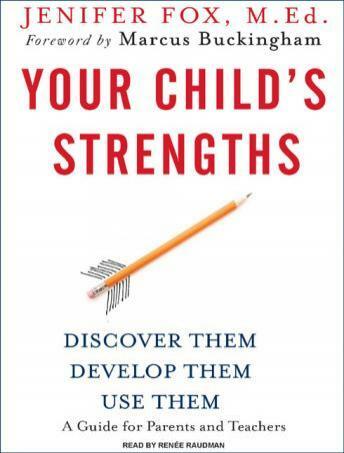 The strengths based approach is a compelling concept that I believe would benefit all children. I hope this discipline will eventually be adopted by our public school systems. Jenifer Fox gives many examples within the book to help get her points across, and I enjoyed it very much.